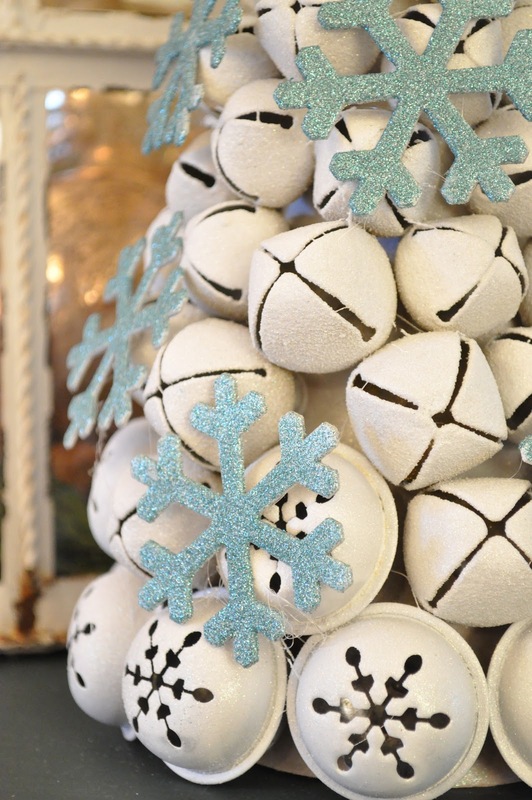 Make a jingle bell tree…. 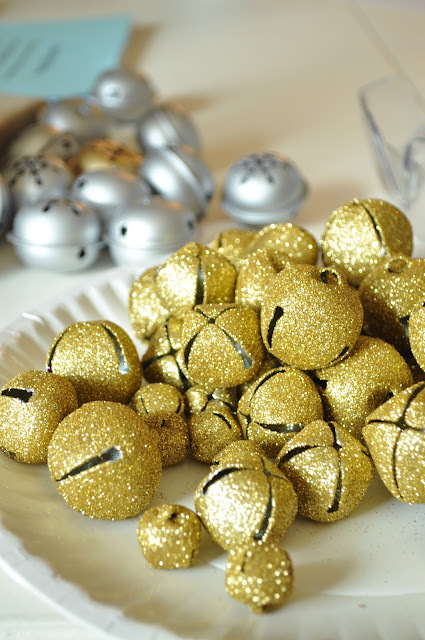 I bought some gold jingle bells on clearance at the end of last season. I wasn’t thrilled about the color, but they were so cheap, I knew I couldn’t pass them up. 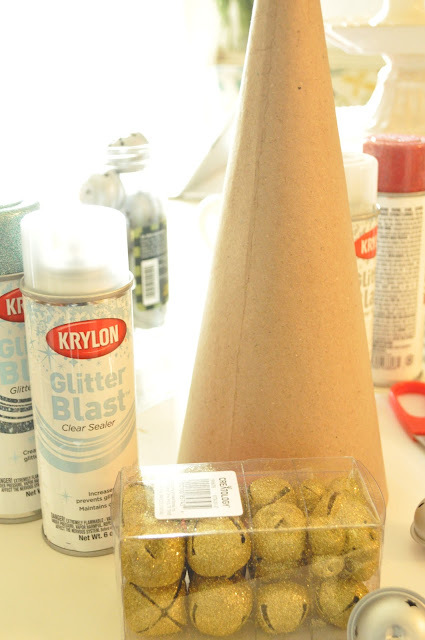 I had some white spray paint and some Krylon Glitterblast to try. I separated out all of my bells according to size. I hot glued them to a cardboard cone. I ended up doing biggest to smallest at first and then I realized I kind of liked them a bit assorted so I changed my a pattern up a little as I worked. 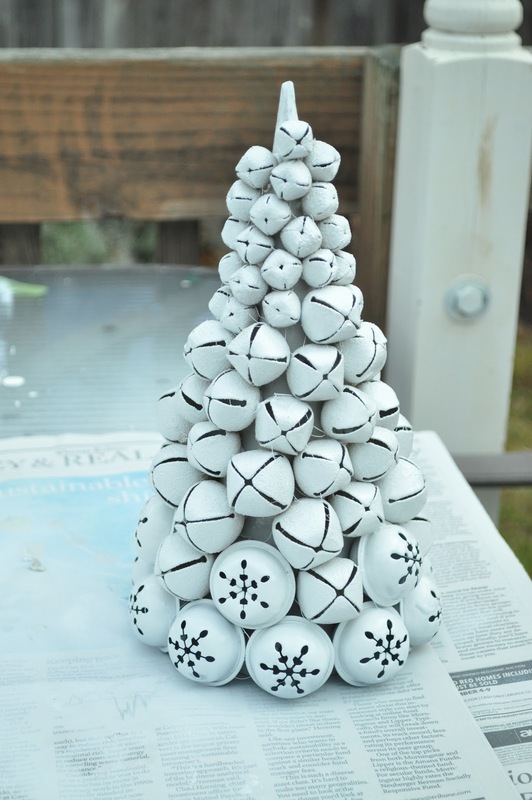 After they were all glued on I took my cone outside and coated it with a few coats of white. 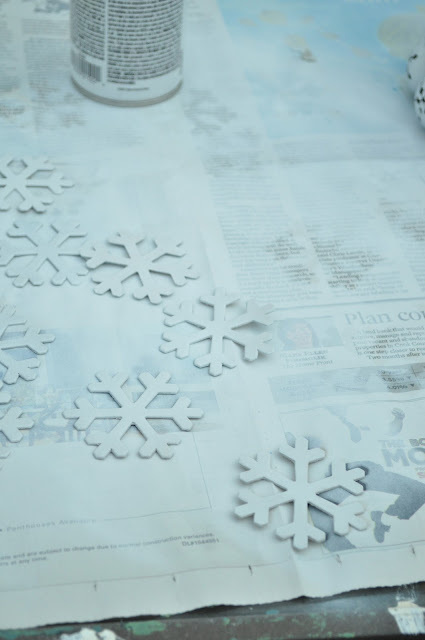 I also covered some craft store cardboard snowflakes which I sprayed later with the glitter blast color sparkling waters. I liked it, but I did notice I had to shake the can a lot to keep it from clogging.I also sprayed my tree in clear glitterblast. Once everything was dry, I hot glued my glittery snowflakes onto my Jingle tree. I think it’s cute! I would recommend buying more bells than you think you need. I had three boxes and I had to trim my cone down, otherwise I could have used 4! and you can still link up your holiday home for a chance to win a spot in next years housewalk!!! What a great idea! I bet it sounds good too! This really has my bells jingling! 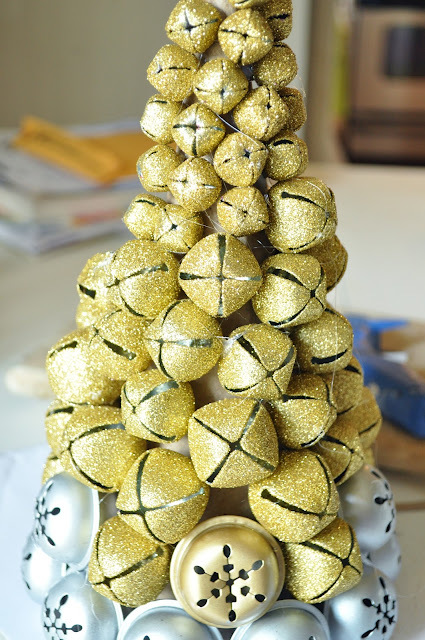 What a great way to make those cheap dollar store bells sing! And isn’t everything better with a little bling?! This is so cute Jenn! I’m all about some cheap dollar store jingle bells. I’ve got ’em all over my house right now. What a great (and cheap!) way to make a fun gift for someone. Love it! Those jingle bells are so versatile. I love the glittery blue snowflakes overlayed on the tree, just the right touch of bling! What a cute idea. This year my granddaughter and I decoupaged cones with christmas scrapbook paper and glitter. This is a good thing to remember for next year, as your tree is quite striking. What a cute idea! 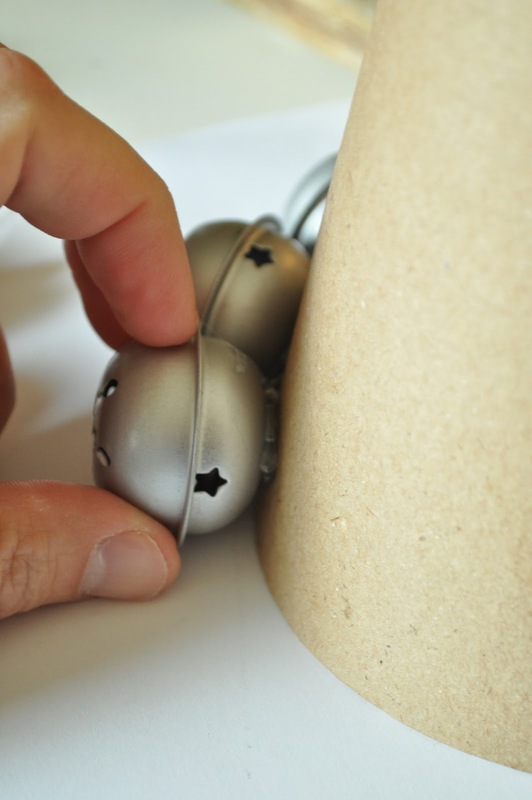 I have a stash of jingle bells that may just have found their purpose in life! Brilliant work! You made something pretty into something dazzling! Love it! Jennifer that looks so pretty! LOVE this idea! So simple too! 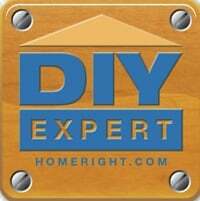 Thanks for sharing I will keep my eyes open for after Christmas sales! 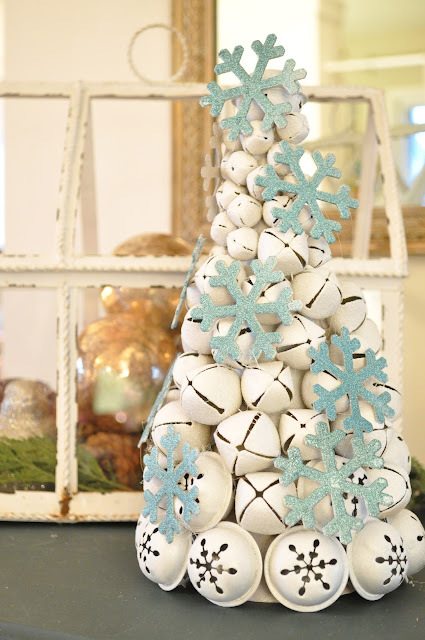 What a creative twist to all the cone trees in blog land this season! 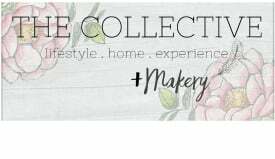 I love your blog and have added you to my Favorite Blogs to Read list. Thanks for the inspiration!